Stadler Form – Home appliances with personality! The rise of the company Stadler Form is a great example for what a man can achieve with vision, courage and the support of friends and family. Fuelled by a personal need in the beginning, the young business now has been awarded several design prizes for aesthetic air improvement technology. Apart from free-standing and floor fans, air purifiers, aroma diffusers, air humidifiers and dehumidifiers as well as various typical Swiss kitchen appliances. "Now we just need good designers"
Stadler Form was founded in 1998 in the Swiss Canton of Zug by the trio Martin Stadler, his brother and an accountant. The initiator loves products with a timeless, distinct design and personality. Common household items for air improvement shall not just disappear into the background, but should be made the eyecatcher of the entire interior. Spurred by this idea the first prototype was developed soon in close cooperation with designer Matti Walker. The first product was released in 1999released product with the adorable name Fred is so much more than just a humidifier: playful elements break the standards for design of household appliances, making it an all-time favourite of the designer scene. Each year more and more appliances for air treatment followed along with kitchen appliances. 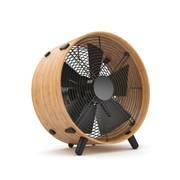 To name a couple of noteworthy examples, the free-standing fan Charly air washer Robert have been given the iF product design award, the red dt design award of the year 2013 has been given to several products: Albert, Oskar big and Anna as well as to air washer Robert in 2014 and hygrometer Selina in 2015. Well-known artists and designers such as Carlo Borer and Fabial Zimmerli continue to amaze customers each year with intelligent concepts and easy-to-use devices. Over the course of time management level has seen a couple of changes in the numbers of shareholders of the joint-stock company. Currently (status 2016) Stadler Form is lead by its original founding trio again. The company Stadler Form was founded in the late summer of 1998 by Martin Stadler. Even before that Mr Stadler had the desire to become self-employed, but it took a very cold Swiss winter to make the decision to gather all his money and courage to make his dream come true. In his mid-thirties he was plagued by dry mucosa and chapped skin. A very uncomfortable condition. In order to find a suitable air humidifier he combed through many consumer electronic retail stores in Zug’s city centre. Three hours of searching later he returned home – empty-handed, informing his girlfriend, now wife, nothing fits in their cool and stylish home! The range of medium-sized shops was not exactly inspired by the newest trends in New York and Milano, but rather practical and a bit outdated. The design-oriented founder felt the available models were too white, too grey, even boring and dull. Yet a humidifier needs to be positioned in the centre of the room to achieve best results. Therefore the device is very present and always visible whether you are sitting on the couch or the dining table. In short, it should not only be functional, but also look good. That is what inspired Mr Stadler to produce his very own model with some pep. Foresightful he realised that there is a great demand for chic household appliances. If he had not been completely convinced that his plans would be successful, he would not have quit his lucrative position as Marketing Sales Manager at Illycaffè to become self-employed. During his previous job history he had already learned a lot about appealing, functional design, unique selling propositions of products and their distribution. However the foundation of a business requires more than his previous knowledge, he was also in need for a solid financial buffer as well as consultative support. Martin Stadler won over his brother and a reliable accountant as associates for his project, so that Stadler Form actually started out as a family business. The first office was set up in the upper floor the Stadlers‘ garage where it all began: designing, tinkering and working all night. Seeing that Mr Stadler was a trained businessman and not a technician (by now he has caught up on the missing knowledge) he was still missing an important employee at that time. Fabricating prototypes of a new product is a drawn out and expensive process. In Switzerland the development phase of a single device costs a couple hundred thousand francs. That means the design must be absolutely coherent before the company takes the step from development to realisation. Mr Stadler himself has always had passion and an eye for sophisticated interior design. However, he does not have any experience with scaled designs and realisation of the product design. And as is so often the case „Behind every great man there’s a great woman“. When Mr Stadler first spoke about his plans at home, his partner immediately thought of the round, unusual office furniture designed by her friend Matti Walker. She was already familiar with Walker’s work and suggested him as leading designer for the young company. Mr Walker, the company founder’s close friend of many years, accepted without hesitation. One year after the foundation of the company the first prototype of the Fred humidifier was produced and sold in Switzerland. Right from the start the close cooperation with Walker proved to be fruitful and lead to many product development projects, until today about two thirds of all Stadler products are his work, including several international awards. Apart from Walker more and more other designers were tasked, too. All designers external freelancers and do not hold a permanent position in the company. This type of collaboration makes spontaneous communication a bit more difficult than it would be the case with actual employees that are present in the company, however it is a decision in the company’s favour. It has actually manifested as an indispensable creed, because it gives designers the chance to keep an open mind and not develop a business-related tunnel vision. Independent work gives creators enough time for taking inspiration from “real life“, from magazines or travelling. The second visionary, Carlo Borer joined soon. Borer already know Mr Stadler from his time at Illycaffè where he designed a coffee machine. This previous contact was revived by the communicative company found and Mr Borer immediately agreed to design a fan for Stadler Form. Above all he is an artist, not a product designer, which is why his free spirit is a great addition to the company. One of his creations is the extraordinary Q fan. From vacuum cleaners to ink jet printers: All electric devices are designed in a certain shape or colour so that their appearance has an appealing effect on customers. It is a matter of interpretation just how much importance should be attached to these criteria, and each manufacturer handles it differently. In case of Stadler Form however, perfected design together with high-quality in construction and technology has always been the top priority. The Swiss producer has caught the attention of countless designers from all over the world and regularly present their portfolio at Stadler Form every one to two months. Foreign applications are politely declined, product designers with place of residence in Switzerland however are examined thoroughly. Business management continues to hold on to the principle that all designers are working externally and come from the same country. The seal of approval “Swiss Design“ plays an important role for Stadler Form. Ideas for new products do not stem from market and trend research, but are evaluated exclusively inside the company and – with the usual level of Swiss discretion – not displayed much before their commercial launch. Only the inner circle of employees are consulted by the management and designers. Product development mostly comes down to luck and the right intuition about other people. In the end it is Mr Stadler how makes the decision for or against a product. His knowledge of human nature is reflected by the successful product range: new launches generally enjoy great popularity on the market. Failures are still part of business life and even Stadler Form have experienced them. Those products are taken are taken off the shelves again. The many devices for air improvement are then distributed all over the world, starting in Zug. The company strives to develop design that pleases every customer no matter where they are from, but the preferences are actually quite different in other countries and cultures. In Japan or southern European countries strong colours like yellow, green and orange for household appliances are very popular and demanded. Centra Europe prefers northern cool, reduced tones such as black, white or timeless metallic grey. Happy colours are not completely rejected, however they are quite an unusual sight in homes. The current trend is to resort to simple, reduced shapes, even square, angular, sincere and linear. The Q statement fan is a great example for what this market is looking for. At first sight it might be shaped rather unusual for a ventilation appliance, however it is not nearly as playful as the product Fred. In contrast the latter is very popular in Italy, the cheerful Southerners like elaborate designs, a bit ostentatios even. There are also huge international differences when it comes to the preferred size of the appliances, which can be traced back to lifestyle and living environments. The Japanese like to buy small appliances, in Tokyo it is actually not uncommon for high-earning managers to live in a 18m2 apartment with kitchenette. That means every piece of the interior needs to be integrated accordingly. The US with its wide, seemingly endless landscapes that give you a feeling of ease, freedom and a show-what-you’ve-got culture stays true to the motto “the bigger the better“! The States have a high demand for large appliances. With that in mind Stadler Form offers a selected, rather small range of 25 devices (plus different colour options) with just the right taste for North and South, East and West. The very own style is achieved not by having a bit of everything, but by concentrating on the essential. Apart from the different specifications in terms of product design, high quality standards apply in every case. In order to check the products for their quality at all times, it used to be Stadler ambition to manufacture all products directly in Switzerland. This turned out to be quite difficult, though. Seeing that production in the own country is an insurmountable obstacle due to enormous costs, money drew to a close after the first three years in Switzerland. In favour of economic feasability manufacturing of all products is outsourced to China. Generally costs in the People’s Republic are lower, but the expenses for quality, including constant examination, must not be underestimated. A Country Manager and Swiss team are directly on site during each production phase, however deviations of product quality can happen in any country, even China. A personal connection to the client is reflected in good quality. And that is, in case of such a spectacular product range, a decisive factor for customers. Business through retail and stores is prevalent in Switzerland and accounts for roughly 70% of turnover. Interested customers want to hold the products in their hands, touching them, before they make the conscious decision to buy the item – meaning there cannot be any flaws. Stadler Form also began quite early to sell online in Switzerland, because look after their websites themselves. Particularly in the beginning online sales grew fast, followed by a period when the market was flooded by excess supply and counterfeit products. After this critical time the online business recovered, the growth is now slower, more qualitative: 30% of sales in Switzerland are achieved by online retailers or are made online. Read more about what the brand plans for the future and the advice Mr Stadler has for aspiring company founders in our Creoven interview with Martin Stadler!